Rosary of the Unborn Finger Cards (25 pack). The "baby teardrop" side of this redesign of the Finger Card/Rosary Ring is similar to the original Rosary of the Unborn designed by Blessed Mother. 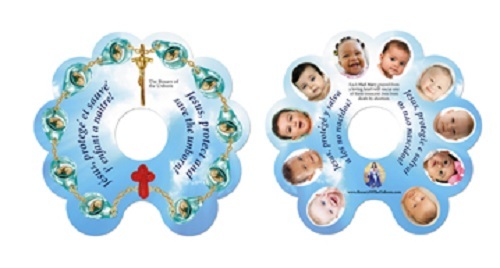 Originally developed for poor countries, the Rosary of the Unborn Finger Card was made available to the United States and other countries in order to quickly increase the prayer effort to end abortion; an affordable way to spread the devotion of The Rosary of the Unborn. "...I affirm to you...that each Hail Mary prayed from a loving heart will rescue one of these innocent lives from death by abortion. When you use this rosary, call to mind My Sorrowful Immaculate Heart which continually sees the sin of abortion played out in every present moment.